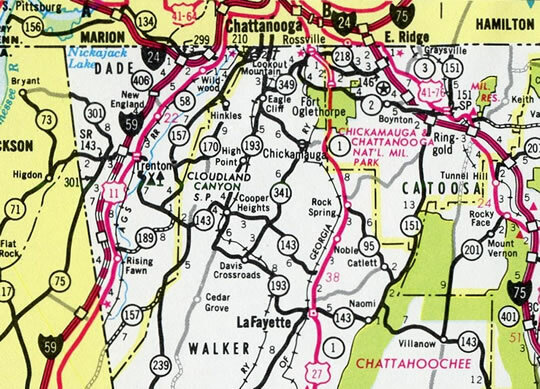 The northernmost extent of Interstate 59 travels through rural Dade County, Georgia. 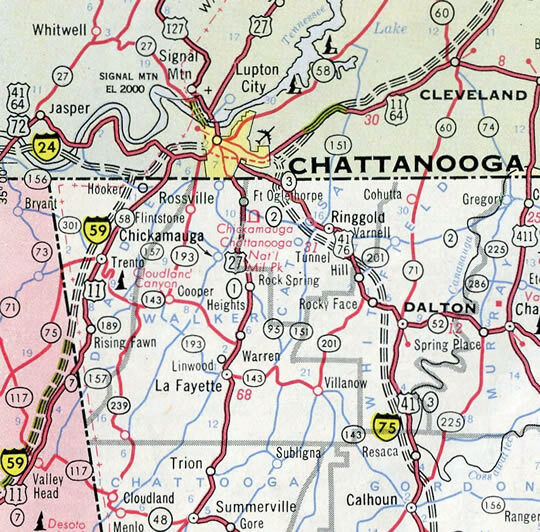 The freeway enters the Peach State through a broad valley between Fox Mountain and Big Ridge, paralleling U.S. 11 north from Sulphur Springs, Alabama to Rising Fawn. Designated as State Route 406 by the Georgia Department of Transportation (GDOT), I-59 shifts west around Lookout Mountain, climbing along the east side of Pudding Ridge en route to the city of Trenton. Continuing north from the Dade County seat, Interstate 59 diverges from U.S. 11 around the west side of McCollum Ridge through Slygo Valley. U.S. 11 stays to the east through Wildwood, as I-59 concludes at I-24, east of Street Point on Tatum Mountain. Interstate 59 proposed in 1960. 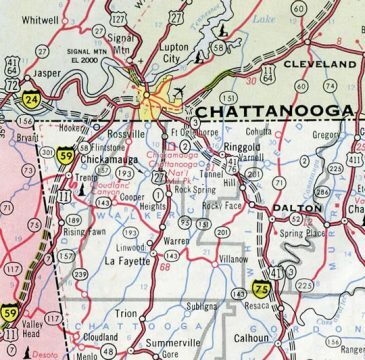 1970 Georgia Official Highway map showing the last stretch of I-59 under construction. It was completed by 1971.